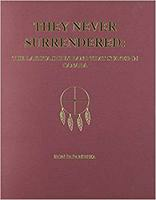 They Never Surrendered. The Lakota Sioux Band That Stayed in Canada. by Ronald J. Papandrea, Lightnight Source, La Vergne TN 2009, partially paginated to 50 pages with a large, non paginated section listing source and reference material.